Dense clusters of violet-purple flowers. Height 38cm (15). 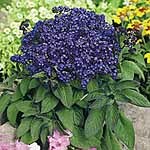 See photos of plants from the <a href="/genus/Heliotropium">Heliotropium</a> genus in real gardens.